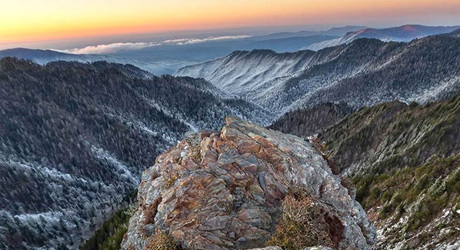 One of the most popular hiking destinations in the Smokies is Charlies Bunion. This unique overlook provides breathtaking views and is accessed via the Appalachian Trail from Newfound Gap. The unique name is said to come from a local resident of the Smokies, Charles W. Conner. As the story goes, Conner was hiking with renowned Smokies enthusiast and author of OurSouthern Highlanders, Horace Kephart. When they stopped for a break Charlie took his sock and shoe off to reveal a bunion the “size of the rock they were climbing.” Kephart saw this and retorted “Charlie, I’m going to get this place put on a government map for you.” Kephart came through on his remark and thus, Charlie’s Bunion was given to the outcropped rock. 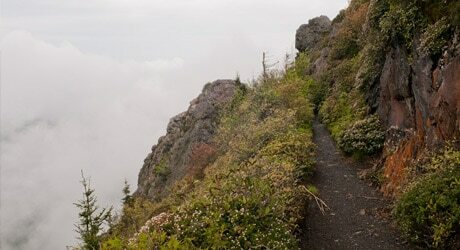 Hiking Charlies Bunion: Though the name might throw your off, Charlies Bunion trail has a lot to offer hikers in the form of views and a challenging hike. The views are remarkable as hikers get a little bit of everything no matter where you’re looking. Off to the north there is Mt. Kephart and the Jump Off to the west, along with Mount Guyot in the east. To start the trail, begin from the Newfound Gap parking lot. The first two miles of the hike will provide rewards to any hiker with a view of the North Carolina side of the Smokies to the south. By the time you reach the Sweat Heifer Creek Trail junction hikers will be rewarded once again with stunning views of Mount LeConte (Backlink) and Myrtle Point facing the northwest. When hikers hit the 2.5-mile mark the Boulevard Trail to Mt. LeConte forks off to the left. Continue going straight though to get to Charlies Bunion. A quarter mile later there will be the Icewater Spring shelter named after the spring flowing from a pipe and into the Appalachian Trail. Once hikers have hit the 4-mile mark from the trailhead, a short spur trail will fork to the left and lead you to the Bunion. Starting at the Sugarlands Visitor Center, drive about 13 miles south on Newfound Gap Road. Here you will reach the Newfound Gap parking lot where the hike will begin. If you’re coming from Cherokee, drive 20 miles north to reach Newfound Gap. A Smoky Mountains hiking adventure is the perfect way to start off a vacation during the hiking season.